I did something goofy last night. Before yoga class, I decided to configure my phone so that I could have it read my Kindle books to me. I seem to spend a lot of time in the truck so it made sense that I could utilize drive time by listening to the books in my Kindle library. I have several of the classics that I have not had an opportunity to read and I wanted to remedy that. So last night I tried several options I'd read about but none of them seemed to work on the Kindle app on my iPhone. Then I saw one entry suggested using Voice Control. It went on to say that it could be complicated but I figured that was a disclaimer. A few moments after I clicked enter to engage the Voice Control, I wished I'd read the details. The setting turned my iPhone into a brick. When we got home, I worked for over two hours trying to take the phone out of Voice Control but I wound up restoring the phone back to factory settings. This meant that any unsaved data on the phone would be lost. Finally, I got control of my phone and this morning I started the long process of putting the data back on my phone. I did have a backup, but it had somehow gotten corrupted. It wanted my unlock code. I put in the unlock code I've used for years but it didn't like that one. I ditched the data and built it back from scratch. After several hours this morning, I needed a walk. So, we bundled up and headed out. The dogs were thrilled. It felt good to get away from the computer desk and look at something besides the screen of my phone. Mother Nature must have felt sorry for me because on the first lap around the barn, I saw moss that was as thick as a carpet in places. 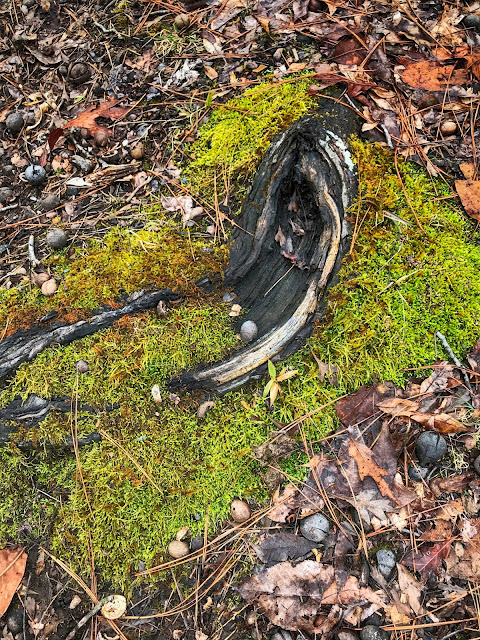 I snapped a picture of moss around a tree root. I snapped the picture below. I hope you've had a good day. Take my advice, do NOT set your iPhone to Voice Control unless you read the disclaimer. I'm probably the only person in the world..except for Jack...who doesn't use their phone for much else except making calls. I do click a pic every now and then but I guess I'm just phone illiterate! I don't do App's! THey all scare me. Like Yaya, I only use my cell phone to call a few people on my list, like family members. I don't even do the updates on it. The new technology is moving way to fast for me. Thanks for the advice though. Thanks for the advice. I will not try that for sure. I try to keep to the basics and nothing more. Nature is always rewarding ! Ah man, getting lost in cyber world is the worst, especially when you do not know how to use their compass... At least youcan navigate! Neat shot BTW! I am not brave. I change nothing on my electronic devices. Without my son I would be without a computer and without a phone.